ENCOURAGE UNDERSTANDING (reading scriptures and playing a game): Read together 1 Corinthians 3:16-17. Invite the children to share what this scripture means to them. Explain that Heavenly Father wants us to take care of our bodies. Place pictures of various foods, drinks, and other items that are either good or bad for our body (such as fruits, vegetables, bread, alcohol, and tobacco) in a container. Make a copy of page 43 in the Nursery manual, and cut it into puzzle pieces. Have the children take turns taking pictures from the container. If the item in the picture is good for us, have the child place a puzzle piece on the board. If the item is bad, remove a puzzle piece. Continue playing until the puzzle is complete (you will need to have more good things in the container than bad things). Ask an adult or child to share some of the blessings that he or she has received by obeying the Word of Wisdom (see Doctrine and Covenants 89:18-21). Love it! When I read that I thought it was perfect for this week. You could even pick a few of the Dad’s favorite treats and make little goodie bags. Then after Sharing Time have the children take the goodie bags to all the men in the ward. For the Dad cut-out you could draw it on a poster-board and then cut out the mouth. Have a bag or box attached to the back and have the children ‘feed’ the Dad the healthy food. And then of course throw away the ‘bad’ food/drink/etc. I wish I could say I came up with these adorable little treats, but sadly I didn’t. But seriously, aren’t these the cutest!?! And they’re so easy to make! –Here are the ladies that came up with these (Click for the tutorial). –And here’s another version from Amy of ‘Then She Made…’ and a few changes she made. And then we have the cute little goodie bags. 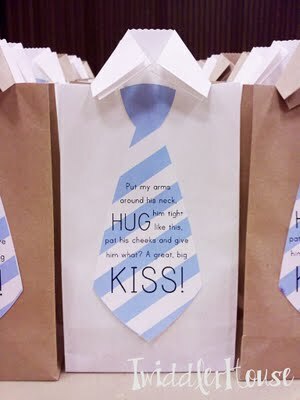 Who would have thought by adding a cute little tie to a bag could make white lunch bags so cute. Just fill up these bags with some favorite treats and you’re good to go. Jen over at Twiddler House created these cute bags. 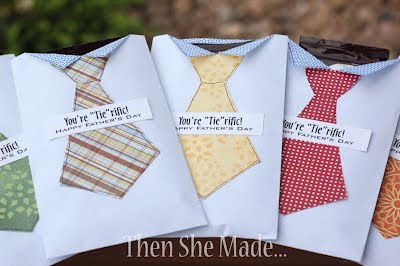 She added a collar and then printed part of the song, “Daddy’s Homecoming” onto the tie. Then she filled up each bag with Hershey Kisses. And she even shared a free printable of the ties, so head on over and take a look! Click Here to visit Twiddler House. Click here to read how to make these little ‘Tie Treats’. Click here to view one I shared last year. I hope all of you have a wonderful week & a great Sharing Time! Without realizing what the theme was, our primary decided to do a “Dad’s favorite recipes book”. We asked most of the children in our primary, there were a few we couldn’t reach, what their dad’s favorite recipe was. This is a great way to incorporate the recipes that we have! i just stumble upon your blog and i find it very interesting and informative. I just subscribe in you email list in order to follow your post. I Love these ideas! i tried to go to the link you shared for Twiddler House, but the site doesn’t let anyone but invited guests to see the blog. Do you think they would let you post the tie pattern on your site? Thanks for sharing all these! They are wonderful!